I don't know what took me so long to buy meyer lemons. I guess because they are a little more expensive than regular lemons, I kind of shyed away. I'm glad I finally broke down and got some! The flavor is so intense and the color is beautiful. They are a little more orangy in color. This just a simple marinade for a simple weekday dinner. It's quick, easy and very tasty! Combine oil, rind, juice, mustard, garlic, pepper and parsley in a small bowl, stirring with a whisk. Place chicken pieces in a large zip lock plastic bag and add the marinade. Let stand for at least 1/2 hour or longer if possible. 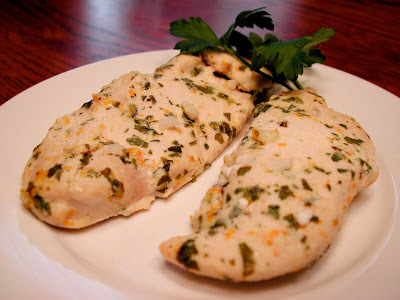 Place chicken pieces on a broiler pan or baking sheet lined with foil. Broil for 4 minutes on the first side and then 3-4 minutes on the second, or until cooked through. This is the year of the Meyer lemon. I just tried my first one a couple of months ago. I really like them, too. I thought they seemed more floral than regular lemons. The chicken sounds very good. Hey! You found Meyer lemons. Pretty awesome, huh?